Have you ever dreamed of winning the lottery? Planned out your life and what you would do with all the money? Thought about how all your worries and anxieties would magically disappear because you’d be filthy rich? I’m going to tell you how I win the lottery every single time I play. No, this isn’t a sure fire system for picking lucky numbers. It’s not a way to game the system. I’m not rubbing two lucky stones together and then reading the clouds. I don’t have a magic crystal ball and I’m not calling Miss Cleo on some 900 number. To be quite honest it’s not really that big of a secret either. Have you ever really thought about what your chances are of winning the lottery? 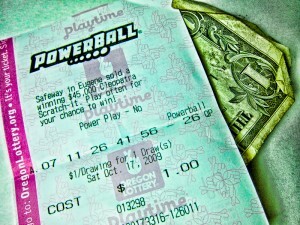 Here in the US one of the largest lotteries is called Powerball. It frequently builds up to over $100 million dollars which creates a frenzy at all the convenience stores with people lining up to get their tickets with the hope of striking the big one and never having to work again. And when those winning numbers are randomly selected and announced millions of dreams are squashed in a single moment. 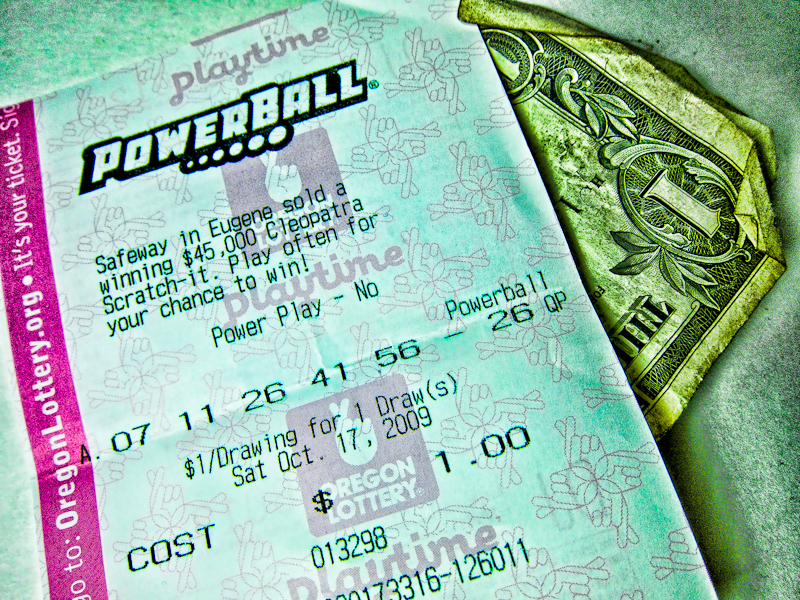 The odds of winning the Powerball Grand Prize (according to the Powerball website) are 1 in 195,249,054. Yes, that’s 1 chance in approximately 195 million. That doesn’t sound too bad does it? Let’s compare that with the odds of a few other things that could happen to you. So what does this tell us? It tells us we have a better chance of dating a super model that then dies from flesh eating bacteria before getting smashed by a giant asteroid than we do of winning the lottery. OK, maybe it’s not so cut and dry but when you look at the odds you can see that you are much more likely to die from a lightning strike than you are of winning the lottery. How many people do you know that think that winning the lottery is the only way to become financially secure? I’ll admit that I’ve been guilty of thinking that once or twice (OK maybe a few more times than that). Oh the thoughts that I can conjure up on quitting my job in some crazy eventful way that people would talk about for years and the exciting and exotic locations I would travel to, first class of course. Sounds great doesn’t it? Of course it sounds great! Who wouldn’t want that. OK, so here is the moment you’ve been waiting for. It’s my secret to winning the lottery every time. Are you ready for it? Be where you want to be, and do what you want to be doing. The day I decided to take this sabbatical and fully commit to it was the day I quit playing the lottery. You see, I’d much rather bet on myself than some random numbers with a 1 in 195 million chance of winning. If I put my mind to something, if I live my passion each and every day not only do I have a 100% chance of succeeding but I will have won the lottery every day of my life because I will be doing exactly what I want to be doing. Now you might be thinking “Yeah that’s great but the things I want to do cost money.” That is so true. Life costs money, but how much money do you really need to do what you want to do? I was surprised when I started to think about what we would need to have saved up before we could take a 1 year sabbatical. You know what I found? It’s a lot less than I had thought. You might be surprised as well. I will say this though; I don’t want to spend any more time doing things I don’t want to do. I don’t want to waste any more time not living my true passions in life. Playing the lottery may be gambling with my money but feeling trapped in a life that isn’t my own is gambling with my health, happiness and legacy. Now I could sit around and wait for everything to line up just perfectly, for all the numbers to match on my ticket in the game of life. But the truth is that it’s never going to happen. There will always be something that knocks me down, some unexpected event that crops up and throws me off balance or stops me in my tracks. Life happens. But I’d much rather take my chances out there in the real world and be living and experiencing an exciting and fulfilling life rather than waiting for things to happen on their own by chance. And that is why I am so excited to be taking this sabbatical. It’s an opportunity to experience world travel and adventure, to seek out and discover more about myself, to learn and grow as a person, to discover and expand upon my passion, to spend more time with my family and to teach my kids that no matter what anything is possible when you bet on yourself. How do I win the lottery every single day? I play my own game. Matt- You totally rocked it with that last line: “I play my own game.” Shazzamm! You had me in suspense the whole post. And you are totally right… rather than focusing on what we can’t do anything about, we can take control of our choices and what we will do with our time. This is what makes us a winner every day. Cheers, man! Hey Ryan! I love how you summed up the entire post in 1 sentence. It’s awesome to see you out there playing your own game. Hope Columbia is treating you well. If you don’t play the lotto you certain not win! If you play the lotto you certain not win! That’s life! win your own game! Hi Souto! Win your own game…I love it. It’s the experiences and adventures that we have throughout life that are priceless. Very good point, Matt. You shouldn’t wait for things to get better, shouldn’t wait an opportunity presents itself, you should go out there and make things better and make an opportunity for yourself. It’s a matter of being a passive observer of life and an active participant. Which one would you prefer to be? Hi Jill! I definitely want to be the person that is an active participant. Being a passive observer of your own life has a tendancy to turn you bitter and pessimistic. Matt. I really enjoyed this post. I think a lot of people put their dreams into some sort of outside situation. I have to win the lottery, only rich people can do that, etc. etc. etc. We can all make assumptions about what or how something is going to be and more often than not, it’s less or easier than we ever imagined. Just the other day my mom was making assumptions about something (deterring me from doing it – don’t remember what it was) and I asked her if she really knew that… The answer of course was no. Well then I went to research it with her and showed her that her worry and her assumptions were all completely wrong. I’m hoping that taught her a lesson. Thanks Jenny! I’ve noticed that I tend to have these preconceived notions about how things work, or how I think they should work and they generally tend to be way off base. For example I thought that taking a 1 year sabbatical would be super expensive and what we are finding out is that it’s not what we expected. I had thought that my employer would not be in tune with what I wanted to do but bit by bit I think they are coming around. It’s funny how we tend to believe the first thing that pops into our head without any real evidence on why we think that. It’s amazing how when I really want something so many voices in my head come forward to tell me why it’s not possible (did I just admit that I hear voices in my head?). I think it’s when we put limitations or stipulations on ourselves that we set ourselves up for failure. Hope you are enjoying Colorado! One of the most important lessons traveling has taught me is that most everything somehow manages to work itself out in the end. It’s all part of the adventure. 😉 I’m looking forward to following your travels. Great post! Hi Laura! It’s amazing how I can look back on all the things I’ve stressed about and anguished over in my life and realize that each and every one of them worked out for the best. I wouldn’t have it any other way. Cheers! Very well put! I was wondering where you are going but I completely agree with the sentiment “But I’d much rather take my chances out there in the real world and be living and experiencing an exciting and fulfilling life rather than waiting for things to happen on their own by chance.” Great way to view life. Hey Peter! Your photos and stories are proof positive that getting out there and doing it is the only way to roll. Hi Matt, I loved this post about winning the lottery. I am one of those people that believe it’s better to be rich then poor. It is a lot easier to do well in this world if you have wealth and abundance. We really have no right to be poor. I also believe that we can use the predictive power of our minds to help us in our quest for prosperity. I sense that you do as well. Continue to follow your Bliss and have fun on your sabbatical. Hi Larry! Yes, money does make things easier but the lack of money should never hold anyone back from doing something with their life. Thanks for your words. Cheers! Matt- you did it again! Fantastic post, dude. It’s been inspiring to watch as you work toward this sabbatical. Way to play your own game, find creative solutions to the obstacles that pop up, and simply make it happen for yourself! And you are so right that the actual financial costs of most of our dreams/goals are really not as high as we may perceive them to be. Deep down, it’s often not the monetary expense, but rather the fear of making life decisions and changes, that actually keep us from pursuing those dreams. Mark! I couldn’t agree more with you that the fear of making life changes is what really holds most people back. I’ll admit that even if I had more money than I knew what to do with I would still struggle with doubt and fear. How am I going to educate my kids? What if my kids get some disease? What if I lose all that money? Isn’t it dangerous to live in Indonesia? There are no guarantees in life. The thing we do have though is our desires and passions. Grab onto those tightly and use them. That’s where the real gold is. Hey John! Thanks for the link to the video. Hilarious! Another really though provoking article Matt. I’ve been thinking about this a lot recently and I suppose in theory a lottery win gives you the opportunity to shortcut the hardwork and skip right to the fun stuff. But, and I’m thinking about writing an article about this, would travel be so gratifying if you were to fund it from a lottery win? Loving your final though though! Thanks Sarah! That is a good provocative thought there. Would the journey and adventures funded by a lotto win feel the same as one that you had to work hard for? I’ll add this to that thought…I paid for my entire college education myself through savings and working hard. When I look back on that I feel really proud that I did it myself. Part of me things that creating a life of travel and adventure on my own would make me feel the same way.